Flew out via Air Canada on Friday July 29th. After the Air Berlin fiasco (scroll down for: Con Stories 1), I was braced for delays and airport hassle, but everything was on time and exceptionally smooth. Early start (my taxi to Heathrow was booked for 5AM), but it meant that I arrived at Toronto’s Pearson International airport at around 1.30PM (local time), a very civilized hour. Was met by Chris Hideg and… (apologies, the name escapes me – let me know, will you, and I’ll update this post), who whisked me out to the suburb of Mississauga and the Delta Meadowvale Resort and Conference Center, which was both hotel and venue for the weekend. Grabbed some lunch, met some fans and more of the organizers/staff, and then took a little time out before the evening opening events. No official duties for me, so I just sat and watched for a while before heading to the bar and meeting yet more people on what was a pleasantly informal first day. Already, I felt comfortable at TFCon. Very friendly bunch! Got a nice early start on Saturday, and was at my kind of ‘dealer’ table before the already huge crowd started to flood in. The organizers set me up outside the dealer room itself in the overspill area, which suited me fine, as pretty much everyone had to troop past on their way in. As usual, I had comics and scripts for sale/signature. So even though I had an official signing slot after my Q&A panel, I was actually signing pretty much all morning — whether it be my scripts or stuff people had brought with them. And wow – what a lot of people came and went. I was so busy I barely got a chance to say more than a quick hello to artist Alex Milne, who was set up a few tables further down, and didn’t get to speak Dan Khanna (a little bit further along) until much later! Once again, I was struck by the conviviality of the atmosphere. Everyone was pleased to be there, and fans, staff and guests mingled with an easy/informal familiarity. All cons should be like this. And speaking of guests, though I’d said my hellos to Garry Chalk, whom I’d met at several other conventions, Paul Eiding and I just seemed to keep passing like ships in the night – with a series of “Hi, we really must talk.”s I’d not met Paul before, but immediately, and just on a quick couple of handshakes, I sensed we were going to get on well… if we ever actually got more than 30 seconds in a corridor! Also, it was really nice to see Joe Ng (who I’d last worked with in 2004 on the sadly truncated War Within – Age of Wrath series for Dreamwave) again. He and I did get a chance to chat, as we shared a signing table that afternoon. But I’m getting ahead of myself. My first ‘official’ duty was a Q&A session in the main function room. Hard to call it a panel, when there’s just you, so largely I just fielded a slew of questions from the audience, many of which were centered around issue #81, the just-announced continuation of the Marvel Transformers series (which ended back in 1991) by IDW. As with C.O.N.S., there was only so much I was allowed to say on the subject and I had to duck and dive around the real meat of what’s going to happen in the series. Nevertheless, the questions (on a whole range of subjects) and answers flowed back and forth for the whole hour without much let up. Once again, I was impressed both by the enthusiasm of the fans and the low key but effective organization of the con itself. The Q&A kicked off with a kind of greatest hits cover gallery from all eras of my work on Transformers, projected via the AV system, and a set-up with one mike in the central aisle and fans kind of queuing up to ask questions worked far better than someone running around with a roving mike. Then, as I say, I had my formal signing slot alongside Joe. Glad we got a chance to talk as he was only around for the Saturday. Joe – it was a pleasure, as always. The first day wrapped up with a live script reading. First one of those I’ve been at for ages where I’m a non-participant, and it was very enjoyable. Great fun, and both the professional voice actors and those recruited from the audience were excellent. Then it was back to bar, where… a) I finally managed to talk, at length, to Paul Eiding and his lovely wife Colleen, and b) Garry Chalk produced a guitar out of thin air and performed an impromptu ‘unplugged’ session for those gathered there. What a talented guy. And my earlier instincts were proved right. Paul and I got on really well. Such a nice and genuine man. Finally, I must mention the many wonderful fans I spoke to, among them Mindy (who famously cosplayed as Beast Wars character Stampy). Finally called it a night around 3AM. Ouch. So, onto Sunday. Once again, though a little later than the previous day, I was at my ‘dealer’ table for the morning, bolstered by several cups of coffee. Delayed jet lag probably!! Actually, before I even started, I HAD two interviews – one for the official TFCon DVD and another for fan site. Anyway, another brisk morning of signing all and sundry followed, and then I was off to my second ‘panel’ of the weekend, this one centering on the art and craft of creating Transformers comic books. As well my standard show & tell, one which I’d put together a while back with artist Nick Roche for a show in Belfast – that follows a page of Spotlight Shockwave through all stages – I had a gallery of rare or unseen Transformers art, showcasing the likes of EJ Su (his original design of Verity and pencils for Infiltration #0), Don Figueroa (Stormbringer pencils), Alex Milne (finished art from the unpublished Energon #31) and Joe Ng (Age of Wrath pencils). Lots more questions (and answers) followed my little presentation, and again – everyone seemed to be really involved, especially for a Sunday morning. Then I signed some more, at one point alongside Garry and Paul, and that was pretty much it. Off to the airport for my flight to New York. Which was delayed! Sigh. Mini-rant time. Actually, the delay was something of a blessing. Because clearing immigration en route from Canada to the USA is a drawn out nightmare! For a start, you still have all your luggage with you! So people are having to push laden trolleys through a tortuous and twisting queuing system. And the line moves at a leaden crawl. Just too bad if you have an imminent flight to catch! And the officials are so inflexible. There was one old guy there, who looked ready to drop, and everyone in the line wanted to move him forwards. But the immigration monkey sent him right back! Just because it wasn’t in his narrow remit to allow a bit of compassion to enter the inflexible system. Just awful! Anyhow, then I was in New York for a couple of days, doing a bit of business and catching up with some old friends. And, mostly, just getting my NYC fix. What a city! I never tire of it. Overall, TFCon was an excellent convention, well organized and very user-friendly, both for fans and us pros. It had all the buzz of a ‘big’ convention without the walls that size of convention sometimes erects between fans and pros. Much recommended! My thanks go to Colin Douglas and his team for bringing me out and looking after me in such fine style. And for sending me back via NYC. Hectic, exhausting – but a whole lot of fun. Cheers, guys. Look out for my thoughts and recollections of Auto Assembly soon! I recently wrote a new original manga for Japanese publisher Million Publishing’s Transformers: Generations 2012 (vol 2), featuring their exclusive toy Stepper. The Allspark have just published the online translation of that manga, and it can be viewed here. Also a reminder that if you want to bag a signed copy of Generations 2012 (vol 2), there’s one up for grabs among my current ebay auctions. Check out the full list here. As promised, ages ago, here’s a round-up of my recent travels to assorted Transformers conventions, starting with C.O.N.S. in Willich, Germany, over the weekend of July 23rd & 24th. Nothing to do with the convention itself, but getting there on the Saturday was a nightmare. Stansted to Dusseldorf – hour and a quarter, hour and half. Normally. But the inbound flight had developed a technical problem, leading to an epic seven-hour delay. Have you ever tried to kill seven (extra) hours at Stansted? Not easy. Note to self: avoid Air Berlin. Clearly, their fleet of aircraft is so miniscule that one technical problem results in that scale of delay. So, instead of getting to Dusseldorf airport at a very reasonable 2.30PM, I arrived at 9.45PM, to be met by a weary looking Tobias and Alex, who — as well as organizing a convention — had been back and to to the airport several times. Went direct to a much delayed meal that had been arranged for me, and got to meet a bunch of the other fans and organizers. A good end to a frustrating day! The next day (Sunday), after breakfast, I was whisked to the venue. Wasn’t sure what to expect. But it was a nice large space, with plenty of dealers and a stage set up for a full rock band (the amazing Rampage – more on them later). Weather was atrocious — I think it rained all day — so the lack of the promised lunchtime barbecue wasn’t too disastrous. But inside the hall spirits were un-dampened. I was set up with my scripts and comics to sell at a table facing the stage, watching as the fans piled in. Lots of fans! Things kicked off in earnest with a brief performance by Rampage, who woke everyone up with their Transformers-themed song, ‘Letz Go Transform,’ which I’d heard briefly the night before as we drove to Willich from the airport. I’m not a huge fan of ‘heavy’ rock, but I was pleasantly surprised how quickly I warmed to Rampage. There was a great sense of Meatloaf-style rock-operatics about their performance and ‘Letz Go Transform’ is a pretty catchy tune. Well worth checking out their website here, which has videos from C.O.N.S to view. For the morning, I pretty much signed and chatted and watched as amazing Cosplayers clanked past my table. A steady stream of people stopped and said hello, and Tobias, Alex and Lucy were always on hand to make sure I had whatever I needed. Lunchtime (and a hot dog) was punctuated by another (longer) performance by Rampage (again, high marks on the sheer entertainment factor – lead singer Smookey and backup vocalist Ines really perform their songs). In the afternoon, I had a Q&A session, which had to be simul-translated into German by Tobias, who was also asking the questions. He did amazingly well, and everyone seemed to grasp what I was saying. Though I have a feeling Tobias cut out a lot of my waffle and got to the heart of the answer when he did it in German. Either that or we use a lot more words. Things wrapped up with another performance (a full hour or so set) by Rampage, who seemed to just get better and better. Most impressed! Then it was food and wind-down, and a toast to the end of a great day. Overall, it was a really well put together and thought out convention, with a dedicated and good-sized attendance for a one-day event. This is definitely one to watch, as I have a feeling things can only get bigger and better. Big thanks to Tobias, Alex and Lucy for bringing me over and making it such a fun and friendly couple of days. Oh, and the flight home was on time/schedule. Hurrah! Back soon with my thoughts on TFCon Toronto! Yet more online auctions to be viewed over on my ebay page – among them several signed Transformers/Death’s Head-related items. For the complete list, click here – and happy bidding! Over the past weekend at Auto Assembly I ran a couple of special raffles to win Movie Masterpiece Starscream or Movie Masterpiece Bumblebee. Sadly, Movie Masterpiece Starscream (Saturday’s raffle prize) went unclaimed. So – if you are the owner of pink ticket 88, please get in touch by replying to this thread and we can arrange a way to get it to you. However – I will need to see proof, in the shape of a scan or photo of your winning ticket strip (carrying the matching serial number), so here’s hoping you kept hold of them! And a big thanks to everyone who entered. RUNNING TO CATCH UP – AA NEXT! Like London buses, TF conventions don’t come for ages – then three come at once! With C.O.N.S (Germany) and TFCon Toronto – reports on both to come, when I have a moment – only just wrapped, I’m off again – this time only as far as Birmingham, for Auto Assembly 2011. This weekend (12-14th August) I’ll be at the Holiday Inn Birmingham City Centre for the UK’s (and Europe’s) biggest Transformers fan convention, Auto Assembly. I’ll be joining the likes of David Kaye, Gregg Berger, David Wise, Andrew Wildman, Geoff Senior, Nick Roche and James Roberts for another wild weekend of panels and events. Highlights for me include the live script reading, which I penned, on the Saturday night and a comics panel, Death’s Head panel and a special Target: 2006 panel on the Friday evening. As usual, I’ll be loaded with original scripts (War Within: Age of Wrath #4 & 5, plus #6’s outline as a free bonus, TF Marvel #80, and the AA voice actor scripts for 2009-2011… though 2011’s will only be available on the Sunday!) for signature/sale, comics (including Marvel Heroes, featuring Death’s Head), graphic novels and more. Look forward to seeing you there! For more information check out the AA website here. 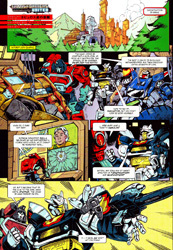 You are currently browsing the simon furman blog archives for August, 2011.